I created this fish owl cut paper art because of Daisuke Kondo’s beautiful photography. I love his wonderful photography. As soon as you see his photography, I’m sure you will forget to breathe because his photography is so beautiful. He takes photos of nature, animals and humans mostly. Especially, I love his black and white photos. I wish I can explain better without using the word ‘beautiful’ but I can’t find other words because his art is very beautiful. He commented to me ‘why don’t you create a fish owl cut paper art’ the other day. I usually take photos or see photos and create original cut paper art, so I was very happy to create with his fish owl photograph. 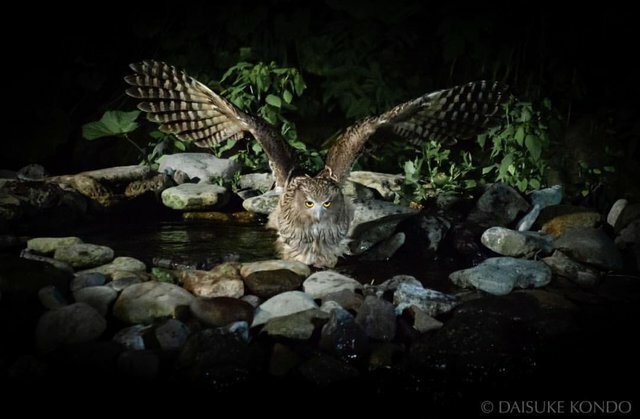 This fish owl is called “kotan kor kamuy” by the Ainu indigenous people of Hokkaido, Japan. “Kamuy” means spiritual or divine-being in Ainu mythology. Now, the number of this fish owls are decreasing. We are facing losing this beautiful creature as it is an endangered species. ・Please visit his website. You’ll see many awesome photographs!!! Thank you! I love to make nature animals’ cut paper art with colorful backgrounds.